South Africa is the custodian of an immense wealth of biodiversity resources, and is estimated to be the third most biodiverse country in the world.1 At the ecosystem level this biodiversity supports the production of goods and services used by us all; water, air, soil fertility, wood, food, etc.2 At a more local level the harvesting of numerous natural resources provides consumptive products for millions of poor South Africans, as well as income for equally significant numbers.3,4 Consumption of and trade in these resources is the very mainstay of their well-being, and crucial in preventing deeper poverty levels.5,6 For example, despite massive improvements in the provision of electricity, most rural and a significant proportion of urban South Africans continue to use fuelwood as a key energy source for cooking (e.g. 65% of electrified households in the urban areas of Makana municipality,7 and 92% of households in the rural areas of Bushbuckridge8); approximately 75% of the population use medicinal plants for medicinal or cultural reasons; and millions of urban and rural households make use of wild edible herbs. With such high demand for these resources, it is not unsurprising that there are large and established trade networks spanning local, regional, national and, for some resources (e.g. specific medicinal plants, mopane worms), international boundaries. The total value of this trade is unknown, and unrecorded in local or national economic or GDP statistics. It certainly equates to billions of rands per year. The direct-use and trade values are substantial and provide a cost saving to the State. Where biodiversity resources are overused or exhausted, people have to purchase alternatives, which reduces their scarce cash resources, thereby increasing their likely dependency on State welfare grants. Currently the responsibility for maintaining these biodiversity resources, both for their intrinsic value, as well as to ensure they continue to supply the household and trade needs of poor households, is fragmented and weakly implemented. The national and provincial departments of the environment have a mandate to conserve biodiversity, as do the national and provincial parks agencies. However, these bodies focus on protection of biodiversity through a variety of land zonation and permit systems, as opposed to balancing that with encouragement and support for sustainable use. They focus on protection of designated conservation areas and high-value or charismatic species. At times this protectionism is implemented in a fashion that has a limited scientific basis resulting in negative impacts on local livelihoods.9 Social ecology or community-based natural resources programmes are lauded in policy documents, but are extremely thin on the ground, and frequently (but with exceptions) engage in displacement activities (self-help groups) to wean participants off dependency on natural resources, rather than supporting and guiding the existing use of resources towards a sustainable basis as part of a diversified livelihood.10,11 It is noteworthy that the area under communal tenure where there is widespread direct reliance on biodiversity resources is over double that in formal conservation areas. The forestry arm of the Department of Water Affairs and Forestry has a mandate for indigenous forests, which, according to the definition in the Act, includes most portions of all the wooded biomes.12 However, because of limited capacity and financial resources they have to be strategic about what they actually do on the ground, and have delegated many responsibilities to lower levels of government. Indeed, the density of forestry officers in rural areas is so limited that most rural inhabitants never meet or see one. Additionally, the emphasis of the department and these officers has always been on indigenous forests, with the considerably larger savannas and thickets receiving only token recognition and presence.13 Felling of indigenous trees requires a permit (although exemptions can be granted), but over most parts of the country this is weakly enforced especially for home consumptive uses. Irrespective, the focus of the officers is to curtail and police the use of natural resources, not to promote sustainable use for improving livelihoods or poverty alleviation (other than the Working for Water programme). For example, how many officers have been trained to work with and advise wood carvers on how to divide up a felled tree to minimise wastage? How many can advise wood carvers on the use of offcuts for smaller and different products? How many can advise fuelwood collectors on how best to cut a tree to optimise the regrowth rate? How many work with harvesters of medicinal plants to implement a rotational harvesting system or diminish the incidence of ring-barking? How many have facilitated controlled access for 'accredited' harvesters to resources on State or private lands? 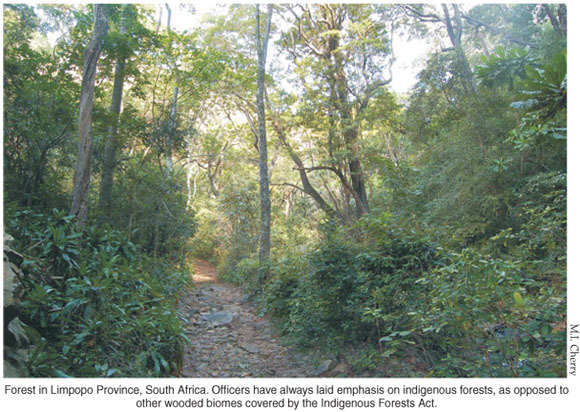 South Africa's submission to the FAO for the 2005 interim Global Forest Resource Assessment had only one entry in the section reporting on non-timber forest products. That entry stated that the national annual use of marula (Sclerocarya birrea subsp. caffra) fruits was 2 000 tons. Nothing was said about the thousands of tons and billions of rand trade in other resources from the forests (in the sense of the Act), such as medicinal plants, weaving and basketry fibres, forest ferns, woodroses, mopane worms, bushmeat, etc.4 Moreover, the figure for marula fruit demand that was reported is based on the commercial demand of a single large company producing Amarula liqueur, and totally ignores the extensive local demand and trade in fruits and beer, which uses more fruit than that used to make Amarula.14 The final FRA report from the FAO did not even include the use of marula, i.e. entries for South Africa into the section on non-timber forest products are blank.15 To all intents and purposes this daily use and trade in marula fruits and all these other resources mentioned is invisible. Is it because the resources are deemed (erroneously) to have little value, or because the users and trade are found in rural villages and poor townships? In 1995 Guijt et al.16 first exposed that widespread local use of such resources was overlooked by authorities, planners and researchers (hence they called it the 'invisible harvest') and consequently its contribution to rural and urban livelihoods and trade was unrecognised. Almost 15 years later government appear no more aware of the local use and value of our rich biodiversity resources. In some areas, local residents look to the traditional authorities for guidance and permission for harvesting certain resources. However, in most areas this has broken down, effectively leaving an institutional control vacuum.17,18 Nevertheless, in those areas where some semblance of regulation remains, the traditional authority lacks capacity to monitor or control supply and demand, and offers no advice on sustainable harvesting methods and land management approaches. They simply collect permit fees, or issue fines when they catch transgressors. This policing is at times appreciated by local communities as a means of potentially deterring external or commercial harvestersbut where such external agencies are determined, the local authorities are relatively powerless to prevent them.19,20 The funds collected by these two means are not invested in sustainable management strategies or education or awareness programmes around natural resource management within the communities where they are levied. There is no active support to promote poverty alleviation or local livelihoods through active, but sustainable, use of natural resources. The Department of Agriculture has a resource conservation division, logically focused on what are deemed as key agricultural resources, namely, grazing and soil. It also boasts a land-care programme, which here and there includes a tree-planting project. These activities operate mainly within the private farming sector to ensure grazing and burning practices are not excessive, and that measures to limit soil erosion are practised. Transformation of natural vegetation to cultivated lands requires a permit. In the communal areas the department has a reasonable, but still insufficient, network of extension officers and livestock health officers that support both arable and livestock activities. This is extremely useful, although the disproportional emphasis on livestock (and hence power of livestock owners) at times is a source of conflict for land-use management decisions that undermine the supply of natural resources that are vital in the livelihoods of the wider community at large, such as thatch grass, reeds for weaving, some medicinal plants, or even biomass fuel supplies.2123 Yet the direct-use value of natural resource extraction by rural communities is the equivalent to the benefits they obtain from both arable and livestock production (all value streams included) combined,24 but there is no extension service for natural resource use and management within this department or others. In conclusion, it is clear that currently there is no government department in South Africa that has a clear, comprehensive and financed focus on promoting sustainable natural resource use. Additionally, there is no government programme promoting sustainable live-lihoods that takes cognisance of the existing immense contribution of ecosystem services and natural resources to livelihoods, and consequently the State. There are far too few formal government initiatives for poverty alleviation based on natural resource use (such as Working for Water), or building on existing initiatives and trade networks of local communities. How long can this continue? Perhaps the time is ripe for the establishment of a directorate of natural resource management in at least one of the national departments that nominally deal with natural resource issues (a cross-cutting rural livelihoods ministry would probably be better). The mandate and focus of such a directorate would not be punitive and policing, but to actively engage with rural communities in a participatory fashion through appropriately trained extension officers to foster harvesting of natural resources in a sustainable manner, and, where the resource is to be traded, add value at a level fitting the target market, i.e. local, regional or national. In local areas where use of specific resources has reached unsustainable levels, which is jeopardising local livelihoods, increasing poverty, and impairing ecosystem structure and function, they would promote activities to address this. There is a large suite of options in such situations, such as promoting sustainable harvest approaches for remaining stocks, a community 'permit' system for outside harvesters, species or resource substitution, landscape or species restoration, enrichment planting, home cultivation or rearing, sourcing sustainably harvested stocks elsewhere, negotiating access to State or private lands for 'accredited' harvesters and community-based monitoring. But with increasing levels of unsustainable use the time has come for the real custodian of natural resource management to stand up. I am grateful for useful comments on earlier drafts from Jenny Botha and Wayne Twine, colleagues with deep experience and insights in natural resource management challenges in rural South Africa.